You can see all of our cladding systems and finishes at our showroom in Bristol. 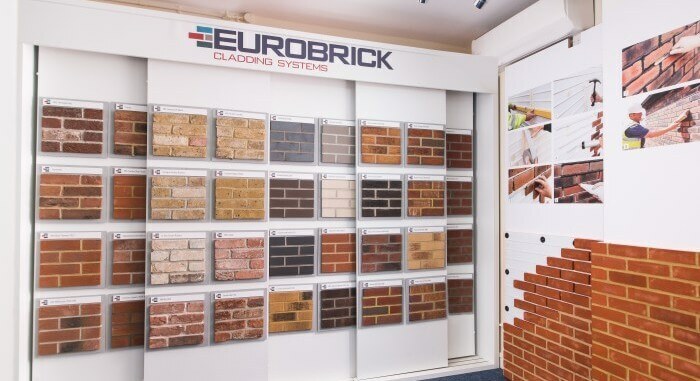 Our full ranges of brick slips are displayed together with a selection of stone finishes and a cut away section of the X-Clad system so you can see exactly how it works. Our showroom is an invaluable aid to helping you select the right products, as you can see and compare different finishes, understand the installation processes and have any questions answered by our experienced staff. We also offer a range of accessories and tools to help with installation and can tell you about our approved installers who could help with your project. We aim to make the whole process from selecting the right system for your project, choosing a finish through to installation, as simple and enjoyable as possible for customers. Our showroom is open to visitors Monday-Friday, 9am-4.30pm. An appointment is not necessary but if you would prefer to make one you can do so by calling us on 0117 971 7117.